Sufficient justification for the purpose and circumstances of the intended stay was not provided. You were unable to provide sufficient plausible, verifiable information about the purpose and circumstances of your stay. Consequently, it cannot be determined with sufficient certainty that all the conditions for ifs its have been met. Sufficient justification for the purpose and circumstances of the intended stay was not provided. Your travel ticket reservation is no longer valid, and no other reservation has been made in its place. Consequently, the purpose of your journey cannot be confimied. Justification for the purpose and circumstances of the intended stay was not provided. Your hotel reservation has lapsed, and no other reservation has been made in its place. As a result, the purpose of your journey cannot be confirmed. Sufficient justification for the purpose and circumstances of the intended stay was not provided. Although you have stated that the primary place of residence during your trip is in the member state of destination you indicated, this is not supported by the documents submitted. 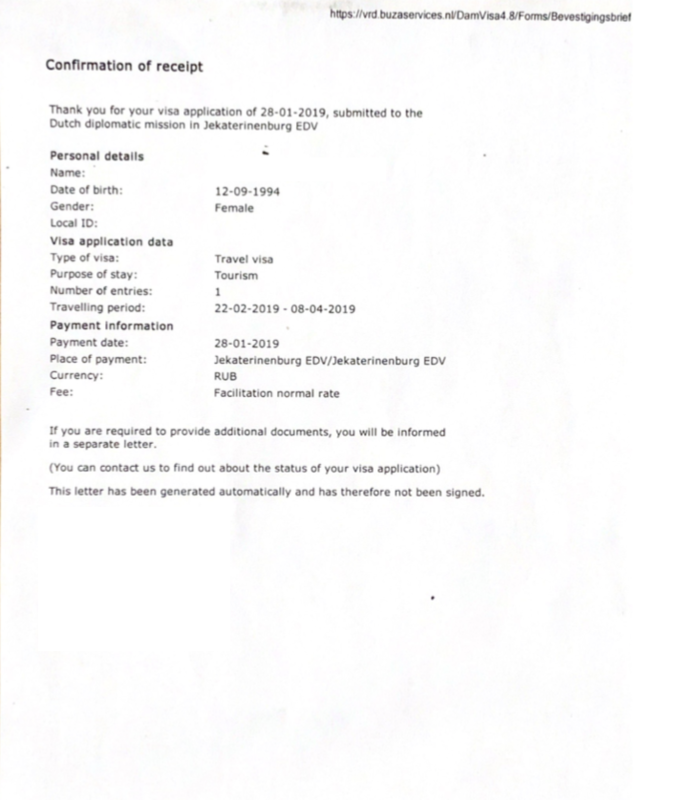 Moreover, the receipt of submission fee (image below) payed by VFS Global (to The Embassy or something with website buzaservices.nl that unaccessible from Russia, idk) that I received with the rejection have traveling period from 22-02-2019 to 08-04-2019. As I was marked as rejected applicant with severe refusal reason, The Embassy of Netherlands in Russia don't want to do anything to resolve this situation and don't say anything besides the reasons described in rejection. What should I get (except saved reputation) if the appeal will success after the end of traveling period requested in application? Should the traveling period from the receipt below be equal to traveling period from the application and can it be VFS mistake? UPD 14.02.2019: After a series of calls to VFS Global they told me that the first date of traveling period from the receipt is gets as two days before the requested period. The second date is generated AUTOMATICALLY by the system the application data was put in. Also we have sent the objection letter to IDL using address from the rejection letter. In NL, the process of disputing your visa refusal is called "objecting" to the decision. If you feel your application was not processed correctly, you can provide an objection in writing. The visa refusal letter that you receive has instructions on how to submit your objection and includes the mailing address where you should mail it to. Your objection letter should explain why you believe the visa application was not processed correctly. Avoid language that might be perceived as rude, and simply present facts. For example: "The refusal letter said that my travel ticket reservation was no longer valid, but $AIRLINE still shows me a valid booking number #####." Repeat this for every fact in dispute. If your objection is successful, you will be advised to make an appointment with the consulate or with VFS Global to bring in your passport to receive the visa. Not the answer you're looking for? Browse other questions tagged schengen-visa netherlands vfs-global or ask your own question.